Tucked away in the upper-story of her parents' house, Aria's room is full of angles, alcoves, and historic character. In this photo, you can see how her room is mostly neutral (lots of linen white and latte brown). There's also lots of texture--the wicker, the woven rug, the hardwood underneath, the soft bedding. Aria's room, with its angled ceilings and exposed beams, gives off a secret hideaway or tree-house kind of feel that I adore. Well, a tree-house decked out by Urban Outfitters, that is. It's a little dark, a little moody, but gloomy in a romantic, vintage, novel-reading kind of way. I love her three windows and the built-in bench beneath them. Ruffled curtains (sooo Anthropologie) add feminine flair right away. The colors that pop up most in this room are rich wine and raspberry hues. Aria's room is bursting with character, even in the tiniest details. I love the gold-plated light-switch cover and the vintage sconce above it. Butterflies and scenic photos adorn the wall behind Aria's big, beautiful, antique desk. A retro chair bridges the gap between the ancient desk and 2012. And a metal waste basket lends its galvanized gleam to the space. As I mentioned up above, Aria's room is full of books. Books everywhere. Stacked on the bench. Lined up in the window sill. Held on shelves hung over the bed. 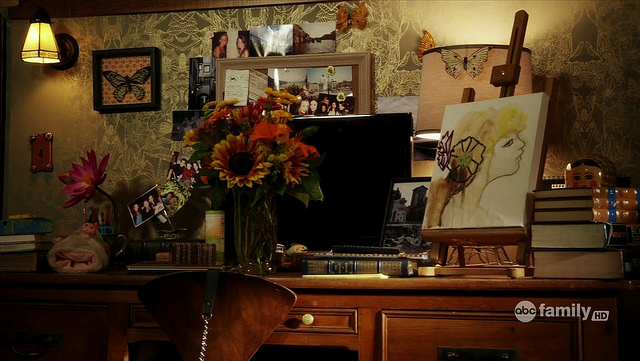 Here, you can see Aria's artwork and easel on her desk... right next a stack of hefty books, of course! Simple materials and neutral colors---like the linen lampshade and beige bulletin board frame---fade away beautifully in the background with understated sophistication. 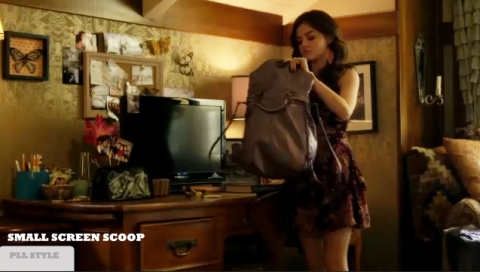 In this photo, you can see that the base of Aria's desk-top lamp is the Eiffel Tower. 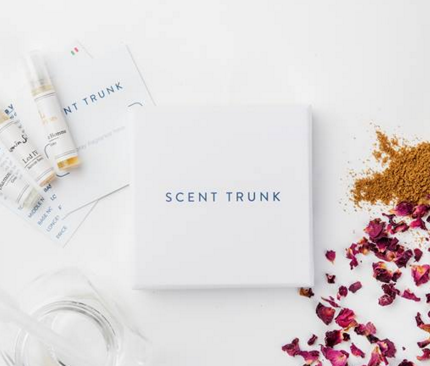 It's an unexpected and totally whimsical touch. Not so dark and gloomy here! The colors really come alive. Her bedding is an almost iridescent champagne. The pillows range from purple to red to pink---but all being lush, juicy jewel tones. I love the wallpaper in Aria's room. It's a muted grayish beige damask-style pattern. Now's a good time to mention what I really like about Aria's bed. It's definitely not a daybed. It's a regular bed with a beautiful vintage headboard and footboard, but by pushing it up against the wall horizontally... it gives the impression of a daybed. Lots of pillows lined up against the wall adds to this daybed/bed-nook feel. I can happily imagine myself dwelling in Aria's room with the damask wallpaper, ruffled curtains, and stacks and stacks of books. But let's talk how you (and I) can bring Aria's unique taste into our domains. Wrought Iron: Scavenge antique and thrift stores, garage sales, and Craigslist for a vintage wrought-iron headboard and footboard. (Even if you can't get both... a headboard is better than nothing!) As usual, be open minded and creative. Just because it's the wrong color doesn't mean you shouldn't buy it. A coat of spraypaint works wonders---and you can definitely get spraypaint that looks coppery metallic. In this room, you could even getting away with mix-and-matching two different headboards. Push your bed up against the wall horizontally and deck it out like a daybed---lots of pillows, luxurious bedding. 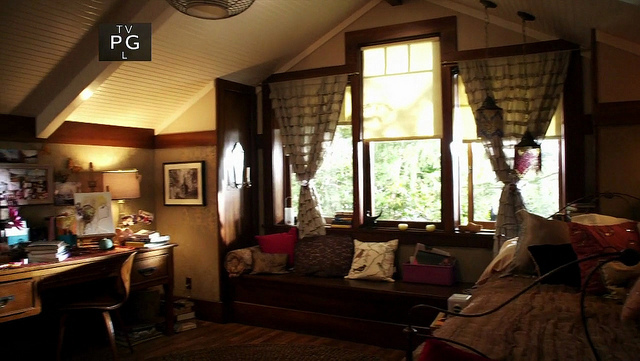 Furniture: Aria's room features lots of dark woodwork that your dorm or apartment might not have. So bring in the dark wood with furniture. A big, dark brown bookcase to display all of your tomes. Instead of a desk like Aria's, I chose a desk that included a hutch. The shelves provide extra storage and contribute to the lots-of-dark-woodwork theme. Don't feel the need to match wood tones... just keep the wood dark and rich. Pick out a MidCentury Modern chair for the desk---one with curves will contrast nicely with all the masculine angles of the room. Textile Textures: Texture adds dimension, coziness, and interest. Bring in a woven rug, neutral in color, to add texture to the floor. A wicker ottoman provides great texture, plus it can double as storage or additional seating. And let's not forget the gorgeous ruffled curtains. Ruffles are showing up everywhere right now---especially in our favorite online shops: Anthropologie and Urban Outfitters. What do you think? 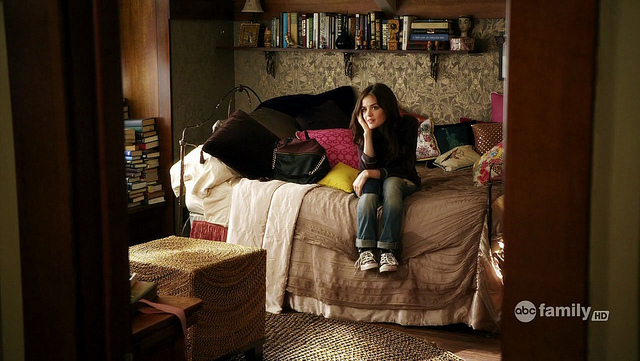 Is Aria's room the perfect hideaway? Or is it too gloomy or overwhelmed with books? Love the posts you're doing about the PLL rooms! I love the show, and it's really cool to look at their rooms through your eyes, and see all the little details that you've picked up. First of all, I love the fact that you're doing this. I actually hope this continues with more TV shows - and if you could pull some in from the 90s that would be especially awesome. Second of all, I love that window seat. Love this post. Agreed Aria's room is hands down the best. Plus thanks for the tutorial! Thanks, Bree! Sometimes I definitely find myself paying more attention to decor more than the actual plot on tv shows and movies sometimes! Thank you, Harriet! I'm glad you're enjoying the PLL Decor Series. Thanks, Alyssa! I hope you got lots of inspiration! I love this! 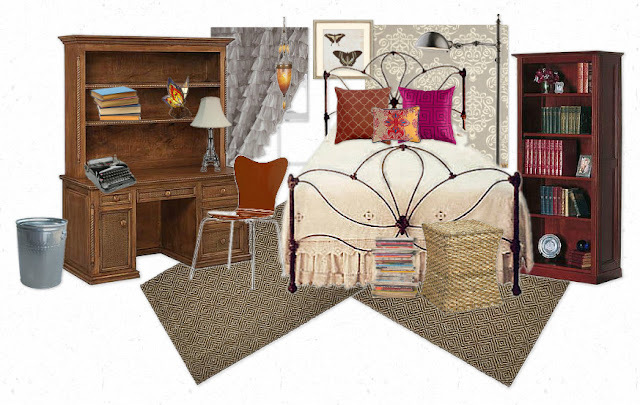 Where did you get the headboard, footboard and the lamps and butterfly picture? 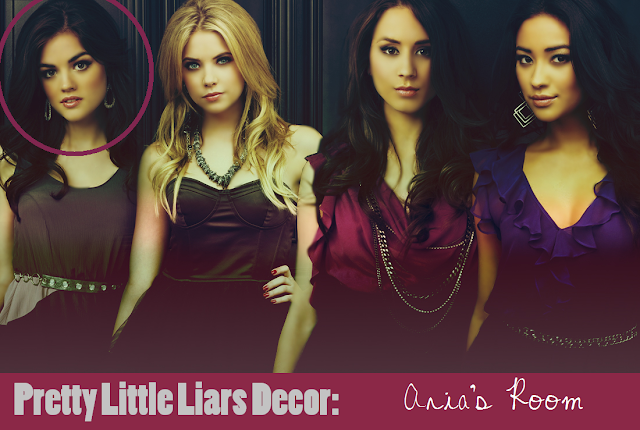 I want to re do my room very similar to Aria's. I love it! I am re-doing my room (which is kinda pointless because I am going into mt Juinor year is high school and will leave after my senior year) and I really loved Aria's room and this is exactly what I was looking for! 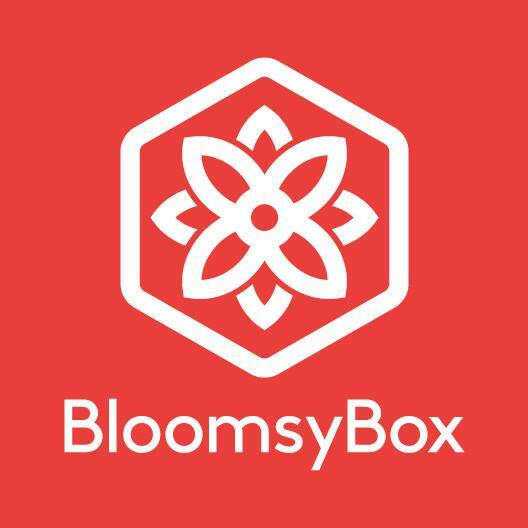 Thank you for the wonderful blog. Would you happen to know where I can get the Eiffel Tower table lamp like Aria's? I've found some similar ones but I want one just like hers. This is great! Could you also do the humphrey's Brooklyn loft out of Gossip Girl? That would be great :) I really love that loft! Can you do a post on Violet Harmon's bedroom from American Horror Story? That would be awesome! 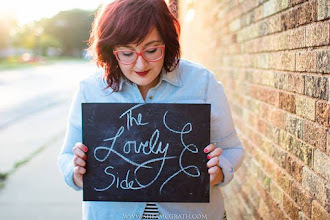 Wow, just found your blog while looking for room inspiration LOVE IT!! Do you know where I could get a bedspread like hers? Do you know where I could get a Bedspread similar to hers? Where can I find a Matryoshka doll like that on the desk? omg I love this post...thanks so much for posting so many helpful details and advice on Aria's bedroom! Her bedroom is the most awesome and eclectic of the 4 girls, and I also find myself just staring at her bedroom decor (as well as the fashion and makeup). It really inspires me to decorate my own room! do you know where I can get that exact wallpaper? where can u find the same wallpaper...i tried the american blinds but couldn't find it...any ideas?? Great post, my cousin watches this show so I'm going to forward it to her! I am quite impressed with Aria's room. She is quite claim true? Me too. I also often piled the books around me so! Wow! Wonderfully designed and well decorated room. Really beautiful. I need some tips to make a beautiful room too! Really amazing. hi! i was just reading "the yellow wallpaper" for my english class and on the wikipedia page it says that aria'a wallpaper is actually the same pattern as the original cover of this classic short story! you should definitely check that out! if this is true, it is a really cool detail for aria, the "bookworm". love it! I found her exact pink lamp shade on ebay! It's by liberty of london, search liberty of london aria pretty little liars on ebay! 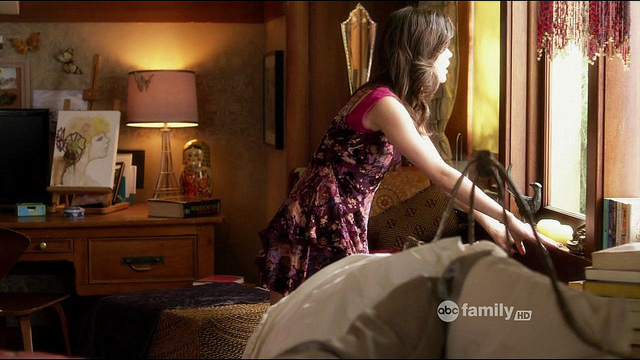 Where are the beaded hanging lights in Aria's bedroom from, do you know? Where can I find that white metal wall art in Penny's bedroom? I'm going,crazy trying to find it.